editable .svg file downloadable in Additional Files. Figure Legend The insect body plan has three thoracic segments - T1, T2, and T3. 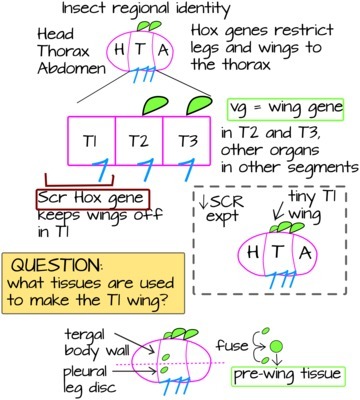 Of these, only T2 and T3 build wings.The Hox gene Scr represses wing development in T1, lowering Scr expresssion in Tribolium beetles gives an extra T1 outgrowth that resembles an elytron6. Looking more closely at the T1 tissue that forms the extra elytron in Scr- beetles, researchers in the Tomoyasu lab found that it is made up of two separate tissues, both of which normally express a gene called Vestigial. Vestigial is normally expressed in early wing tissues (called "wing discs") but is also expressed in a few other tissues in the insect body. The Tomoyasu lab was very intrigued by the fact that two non-wing Vestigial expressing tissues were repressed from coming together to form a wing by Scr. These two tissues are called the pleural plate (the ventral-most tissue, referred to as "pleural") and the carinated margin (the dorsal-most tissue, referred to as "tergal"). The Tomoyasu lab hypothesized that wings evolved from these two body wall tissues fusing together and growing out of the body.